After being called abroad for business, Ambassador Friedman cancels visit by deputy embassy chief to terror victim's family. The US Embassy in Israel has cancelled a planned visit by embassy representatives to the home of a slain Israeli rabbi in Samaria, after the ambassador elected to send a personal letter to the family in lieu of a visit by his deputy. 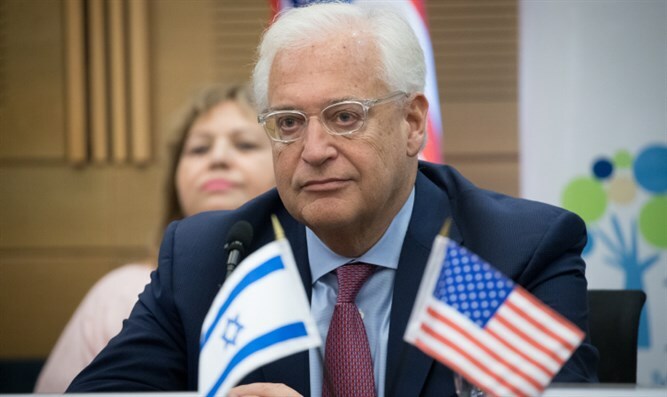 While the US mission to Israel had originally planned a visit to the Shevach family home in Havat Gilad and made preparations for the visit, Ambassador to Israel David Friedman cancelled the visit Sunday. Friedman, who is currently abroad on business, has decided to pen a personal letter to the family of Rabbi Shevach, rather than send the US embassy’s deputy chief, Leslie Tsou, a member of the US mission to Israel told Arutz Sheva. "Since he is out of the country and unable to make a shiva [condolence] call, Ambassador Friedman will send a letter of condolence to the family," the embassy official said. "The Ambassador preferred to send a personal message of condolence rather than send a representative."